Have you ever wondered why early education is important for kids? While most kids only start to get a formal education in kindergarten, studies now show that all children start to learn from the moment they’re born. In other words, if you wait until ages 5-6 to start engaging with your kid’s about learning, you’re missing out on some pretty formative years. So, what exactly is the value in getting your early learner started in education as soon as possible? Amazing Explorers explains a few key benefits of early childhood education below. Have you heard of the Abecedarian Project? This was a groundbreaking early education program that showed the world the positive impact and benefits of long-term early care and education. This program gave full-time, high-quality education for “high-risk” children ages zero through age five with childcare and then watched to see how the children performed against a control group of their peers. What they found was shocking: that there are long-lasting benefits to early education, some of which even overcame disadvantages of poverty. Adults who experienced formal early education had enhanced long-term IQ and academic achievement. They were also less likely to engage in substance abuse or criminal behavior, 4x as likely to have attended a four-year college and much more likely to have been employed consistently. A child’s brain and neural development happen long before kindergarten. In fact, a child’s brain develops 90% from birth to age 5—more than any other time in their life! This makes these early years a perfect opportunity for young children to learn and to grow in their education, making connections and learning the skills they’ll need in the 21st century. Our Amazing Explorers get to explore, investigate and build skills in early literacy, language, problem-solving, critical thinking and STEM while experiencing the pure joy of learning. 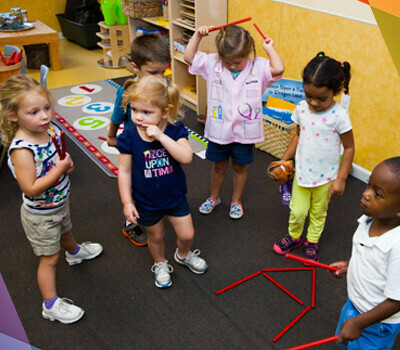 We tailor our programs for infants, toddlers, and preschoolers to help them at their current stage of development so that they learn on their own terms and at their own pace. Kids and toddlers learn from the adults who care for them. Research suggests this starts as early as infancy, and that emotionally supportive interactions and instruction are the foundation for how children learn. Pre-kindergarten education programs like Amazing Explorers allow for consistent stimulation and interaction for kids as they explore the world around them, with caregivers that engage with them and inspire them. Is your child ready to be an amazing explorer? Schedule a tour with us at our Oviedo, Waterford Lakes or Lake Nona locations, and we’d be glad to show you how we foster a nurturing environment for the great minds of the 21st century.